Do you know that feeling when you finish reading a book in a series, and the only thing you want to do is crack open the next one? What about the feeling when there is no next one yet? Well, my wait for the next one has recently ended, and I’ve finally gotten around to actually going to the bookstore. What better way to celebrate a new book (other than reading it!) than with a new bookmark? Ch 50, then finish off. 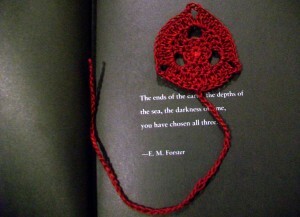 This entry was posted on Saturday, October 17th, 2015 at 12:00 PM by Candace	and is filed under Free Crochet Patterns. You can follow any responses to this entry through the RSS 2.0 feed. You can skip to the end and leave a response. Pinging is currently not allowed.